Wow! 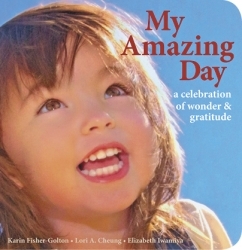 We sooooo love this book that helps children AND adults celebrate the ordinary as extraordinary, learning to be grateful for all that is, in fact, wonderful in our lives. The photography is captivating with pure joy jumping off of every page. Experience the world through the eyes of a joyous child and you can't help but smile. The ordinary is extraordinary when seen through little ones' eyes. My Amazing Day is a remarkable everyday journey that ends with a happy burst of gratitude. People have long experienced that expressing gratitude brings them happiness. Now scientific studies show that expressing gratitude leads to many health benefits as well. Sharing My Amazing Day can be a joyful way to help establish habits of gratitude with the youngest people in your life.